Can i apply for NDA after 12th commerce? sir,i am still studying in school but i wanted to know that i can apply for NDA after 12th commerce? How to join Navy after 12th commerce? Can i get a job in Army after completing 10th class in Andhra Pradesh? Can a commerce student apply for NDA? Am i eligible for NDA entrance exam being a Commerce student? How can i improve my General knowledge? 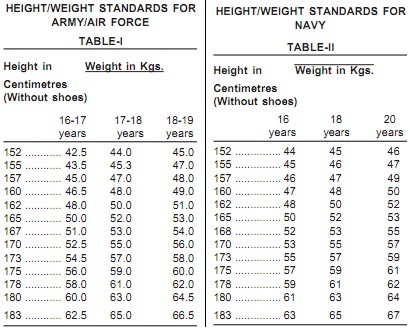 How can i join the IAF after completing 10+2 with 60%? Jobs on Intermediate qualification in Army or BSF or CRPF? Can i apply for government job after passing 12th from commerce with 69%? Re: Can i apply for NDA after 12th commerce? you should be passed the 12th with physics or math with atleast 55% marks form any recognized institute. Age limit: age must be between the 16.5 to 19 years. or 5 years age relaxation for the SC/ST or 3 years age relxation for the OBC.. Yes, you can attend UPSC NDA exam after 12th class in commerce stream. This exam is conducted to select candidates in major defense wings namely Indian Navy/Air force/Army. To join Indian Navy or Air force candidates need to complete 12th class in science stream. Being a commerce student you can apply for positions only in Indian Army. Minimum age limit to apply for this exam is 16.5 years. Maximum age limit to apply for this exam is 19 years. It is mandatory that male candidates who are unmarried can only attend this exam. The first stage of selection will include a written examination. If you clear this level, you will need to attend Physical test and personal interview also. You are not able to apply for the NDA examination because to appears for the NDA you must have the qualification of 10+2 science with physics and maths. SO you are not able to apply for the NDA examination. After completing the graduation you can apply for the SSC examinations and the CDS examination in non-tech branches. Or you can apply in the no-tech branches of Air force after completing he 10+2 through the open rally recruitment process. All the best. can i apply for nda in 11th standard? Sorry to say, Commerce student can't apply for NDA exam. Only science student can be appear in this exam. UPSC conduct nda exam every year two time for three wings of nda Airforce,Army,Navy & Navel Academy. Aspirant must have passed 12th class with 55% marks from a recognized college with following subject Physics, mathematics, and Chemistry. Only unmarried male candidate can be appear for nda exam and Age should be between 16.5 years to 19 years. Yes friend, you can apply for NDA exam being a commerce student . But you can only apply for Indian Army. NDA stands for National Defence Academy. This exam is conducted by UPSC twice in a year. 1] The candidate must be a citizen of India. 2] The candidate must be unmarried male. 3] The age limit of the candidate must be 16.5 ot 19 years. 4] The candidate must be completed his 12th class from any recognized university. 5] The candidate who is appearing in the 12th class can also apply for this exam. 6] The candidate must be physically as well as mentally fit. Yes, you can apply for NDA after completing 12th commerce. NDA (National defence academy) conducted by UPSC for the entrance into defence sector. You can join Indian army after completing 12th in commerce. However you may join being in class 12th but you need to submit the pass proff within specified date in notification. The age limit determined here is 16.5 years to 19 years. You must have to be male student and also unmarried for applying in it. For applying in it, you need to wait for next year as this year application procedure has already completed. You can apply for NDA exam (for Army jobs only). >>12th pass with math,physic,chemistry from any recognized board for Navy/Air force. >>12th pass with any stream from any recognized board for Army. >>Age is between 16.5-19 yeqars. >>Candidate must be a citizen of India. >>Candidate must be a male candidate. >>Candidate must be an unmarried candidate. Details about NDA exam? Can i do NDA with commerce stream? I am I eligible for attending the NDA exam if having a 56% of marks in the 12th class? Where can i get NDA forms after 12th standard? Send me the ecopy of the form if i couldn't register by 31st?